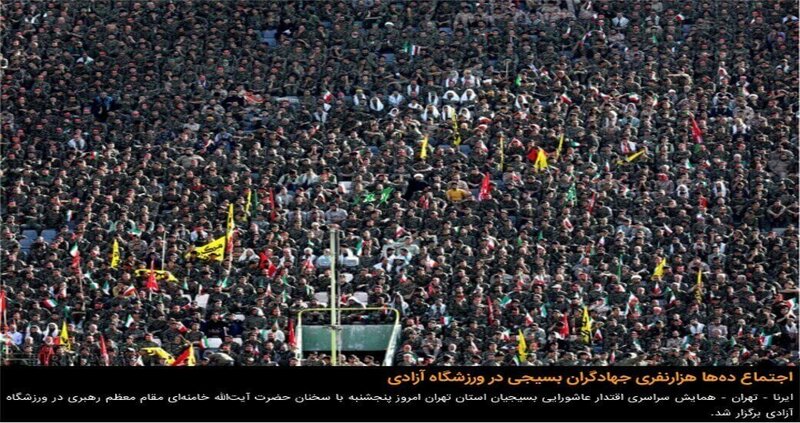 In their thousands,the bassijis gathered to cheer their Allah, God, Ali Khameinei. They are the ludicrous caricatures of an ignorant public that prevent the Iranian society to progress. 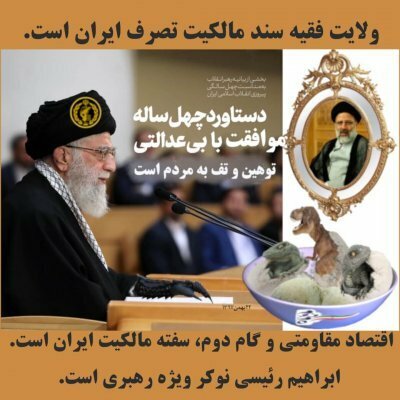 Ignorance is a bad seed, which tyrants such as Khamenei and co. cultivate among their subjects. Quoting Khomeini (approximate): Muslims should think of getting rid of the Devil and not let the sharks [i.e. the West] wolf them. N.B. : Muslims are kindly requested to tolerate each other before giving the world lessons. Censorship and propaganda does not and cannot prevent freedom to think and to feel. The Iranian ayatollahs cannot interfere there, but by using violence and coercion they can and do prevent freedom to communicate. The knowledge that they can do this has a disastrous effect upon the writer and the reader. The writer is afraid of clearly expressing himself. More often than not the journalists of Iranian media copy and paste what the ayatollahs have ordered him to write. The reader is aware of this fact, and his first reaction to the media headlines is All lies – همش دروغه. Since he is prevented from receiving the communications, he relies on rumours; spreading malicious gossip himself. Like the journalist, the reader is inhibited, though in a different way: he remains ignorant. Ignorance is a pronounced characteristic of the public in Iran. When people ignore each other and deny facts, there is no hope for betterment. Censorship and propaganda also have a disastrous effect on the Iranian migrants to the lands that have welcomed them in the West. They do not read Iranian media, considered a waste of time, but rely on their correspondents to keep them conversant with the events in Iran. In other words, they rely on the rumours that have been shaped to their correspondent’s taste and opinions. This, added to a nostalgic view of their home country, produces a distorted and tenuous image. Our team is confronted with loads of false rumours, and groundless material emailed, notwithstanding bona fides, by our Iranian readers on a daily basis. Some of the subjects hinted at, which we pursue, are based on there is no smoke without fire, albeit there is a long way to go before each material is checked and confirmed. Interestingly, subjects related to the violation of human rights, such as the fate of Jason Rezaian and Reyhaneh Jabbari, to name the latest who have been headlines in the West, are absent from our readers’ care. Often, upon our enquiry, their replies are far from the facts, or they have never heard of these violations. In fact, they do not really care about such matters as long as they feel safe by obeying the ayatollahs’ lines of conduct in public. They do not realise that they are enslaved. The Iranian generation brought up in the West, borne from the refugees who fled the revolutionary Iran in the early 1980s, is somehow prepared to face the democratic values and debates. The future will show if they are able to use their capital of education for building Iran with the younger generation in the country, or follow their elders on the path of fear, apathy and gossip. Once more, and we are repeating ourselves unashamedly, structuring democracy is not about having the right kind of State institutions. It is all about the people’s willingness and the understanding of their environment with an informed opinion. We Iranians have a very long way ahead of us.